Plants are one of the most common toxic agents, and plant intoxication claims attention to specialists because there is no specific medication to this cases. This work departure from the analysis of disposable data about plant intoxication in Toxic-pharmacological National System. Looking for quantify human intoxication by plants in Brazil between 2006 and 2016. This study was developed using intoxication data, disposable in Toxic-pharmacological National System of Information (SINITOX) available in https://sinitox.icict.fiocruz.br/dados-nacionais. Plants represented an average of 1.29% of all cases of human intoxication, with a subtle tendency of reduction over the years. North and Northeast Brazilian’s regions presented the lesser frequency of cases, but the higher lethality. While south and southeast presented the inverted pattern, and Midwest presented intermediate rates. Food intake, suicide, and inadequate use are the most frequent circumstances associated with plant intoxication, in that order. The 1-9-year-old is the most affected age group, representing 59% of plant intoxication cases. The incidence of cases are very similar between male and female but is very higher in urban areas. Recovery rate is very similar through the years of study. North and northeast regions probably have low registration of cases, maybe, the due difficulty of access and search for medical care. Children are the most affected group perhaps of typical curiosity and cooking play present in this group. The slightly higher rate of 20-29 age group possibly is associated with higher abortion attempts. Besides the lack of specific medications to treat plant intoxications, medical treatment reaches more than a half of recovery outcome. Keywords: Plant lethality, Intoxication frequency, Toxic plants, Poisoning. Intoxication is a pathological process as a result of voluntary or involuntary contact with harmful substances, called toxic agents, whose effects modify organism functions, and promote physiologic instability (AZEVEDO; MORAIS, 2018). Contacts with toxic substances usually occur through inhalation, ingestion, eye or epithelial contact (CAVALCANTE, 2015 apud OGA; CAMARGO; BATISTUZZO, 2014). Usually, intoxication is classified according to the origin of the toxic agent (endogenous or exogenous), and time of toxic agent exposition, leading to chronic or acute intoxications. The severity of intoxication cases depends on the susceptibility of the individual, the concentration of toxic substances, kind of toxic agent and time of exposure (GARCIA, 2017). Plants are the ninth most common toxic agent (GARCIA, 2017). Toxic plants are all vegetal organisms in which specific circumstances of contact or conditions, are potentially harmful to humans or animals organisms, generating metabolic instability and intoxication (CAVALCANTE, 2015 apud MARTINS; GERON, 2014). Plant intoxication claims the attention of toxicologist, especially because there is no specific medicine to its effects (PINILLOS et al., 2003). Main plants toxicity comes from toxic proteins and chemicals substances associated with secondary metabolism, usually organic acids, phenolic compounds, alkaloids, terpenes, and terpenoids. Acting mostly through ingestion and physical contact (CAVALCANTE, 2015 apud OLIVEIRA, 2002). Plant toxicity depends on the production of toxic compounds (which varies seasonally), life stage, part of plant body (different parts produce different compounds or same compounds with different concentrations) and plant species. Other aspects, which influence on the toxicity of plants, are associated with individual characteristics, as the rate of body esthesia to toxic compounds, response pattern and way of contact (CAVALCANTE, 2015 apud OLIVEIRA; AKISSUE, 1997). 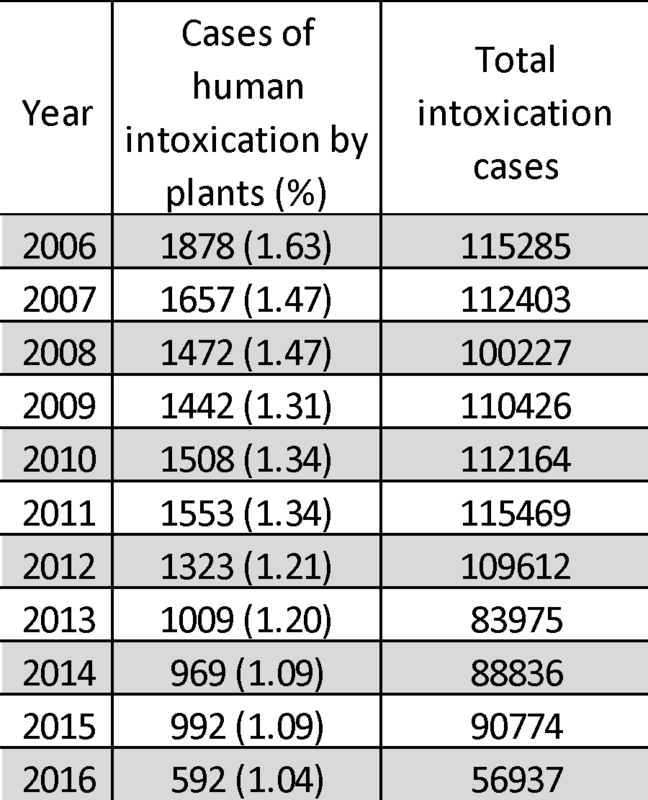 Quantify human intoxication by plants in Brazil between 2006 and 2016. The present study was developed using intoxication data, disposable in Toxic-pharmacological National System of Information (SINITOX) available in https://sinitox.icict.fiocruz.br/dados-nacionais. From tables 3, 4, 6, 7, 8, 9 and 10; in tab “dados de intoxicação” and them “dados nacionais. Using the option “casos/óbitos”, for every year, and consulting all tables numbered before. All the percentage of registered cases of intoxication by plants were relative to all human intoxication by plant, registered cases during the period. All data were compiled to Excel component of Microsoft Corporation Office pack and represented through graphics and tables. Recovery was analyzed by a number of cases whose outcome in recovery per year. Intoxication by plants represents an average of 1.29% of all registered cases of human intoxication for the 10 years period. Table 1 shows the total number of registered cases of intoxication, and the number of registered cases associated with plant intoxication. In general, the relative frequency of intoxication by plants gradually reduced over the years. In the first year, the rate was 1.63%, and then, it dropped to 1.47% in the next year. That rate lasts in 2008, but in 2009, it reaches 1.31%, keeping reasonably stable until 2011. After that, it dropped to 1.21% in 2012 and 1.20% in 2013. During 2014 and 2015 it has stabilized at 1.09%, until drop again, reaching 1.04% in 2016. Table 1. Number of registered cases of human intoxication, and number of cases related to plant intoxication. The general pattern indicates a reduction of cases during the analyzed period. The graph 1 shows the percentage of registered cases of human intoxication by plants between 2006 and 2016. The highest rate is observed in 2006, and it gradually reduces until 2010. During 2011, the rate suffers a bland rise. After those years, the reduction tendency restarts, reducing drastically the number of cases. 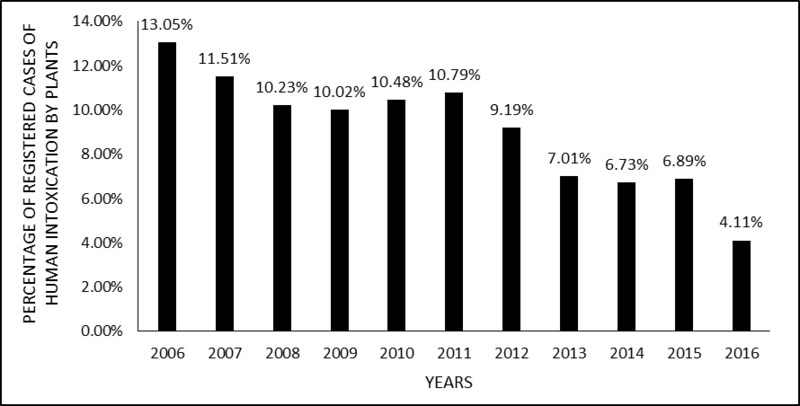 Graph 1:Shows the percentage of registered cases of human intoxication by plants between 2006 and 2016. The distribution of cases based on Brazilian’s regions exhibit a higher concentration on south and southeast regions. Graph 2 shows the distribution of registered cases of human intoxication by plants between 2006 and 2016. North and Northeast regions show the lower rates and Midwest presents an intermediary rate. Graph 2: Distribution of registered cases of human intoxication by plants between 2006 and 2016. The major circumstances associated with intoxication by plant cases are presented on graph 3. Food intake is the main reason of human’s intoxication by plants. In addition, it is followed by suicide, inadequate use and abortion on that order. Other expressive occasions of intoxication by plants are represented by occupational and self-medication use. Graph 3: Circumstances associated with registered cases of human intoxication by plants between 2006 and 2016. Age group distribution of cases of intoxication is shown on graph 4. Almost half of the cases can be found in 1- 4 age group. The highest’s rates are remarkably concentrated on the first years of age, between 1 – 9 years. Along with age groups, there is a high tendency of reducing the number of cases. Although there is a great reduction between early childhood (4 – 9 years), late childhood (10 – 12 years) and teenage (13 – 19). After these age groups, there is a subtle increase of rate in 20 -29 years. However, after that, another reduction tendency can be observed. Graph 4: Age group distribution of registered cases of human intoxication by plants between 2006 and 2016. Table 2 express gender distribution of cases. The occurrence of intoxication of plants in the analyzed period is nearly equitable. However, it is slightly higher (54%) on the male group. Table 3 shows the location of cases. There is a high predominance of registered cases in urban areas when compared to rural areas. Recovery rate per year is high on the beginning of the period. Recovery data is shown on graph 5. Until 2013, cases with recovery outcome was higher than 50% of registered cases of intoxication by plants. Representing that only 3% on average of all cases of intoxication by plants ends with other outcomes, like death, sequel or unknown outcome. However, since 2011, the recovery rate starts to reduce, reaching less than the half of the registered cases in 2014, and it continued to reduce. Achieving lesser results during 2016. Graph 5: Distribution of human cases and recovery of registered cases of human intoxication by plants between 2006 and 2016. Another analyzed clinical outcome was lethality. With the provided data, it was possible to separate lethality rates according to Brazilian’s regions, percentage presented in graph 6. North region have the higher lethality rate, reaching 2.24% of the cases. Followed by the northeast with 0.54%. Southeast and Midwest have approximately the same rate, 0.13%, and 0.12% respectively. South region possess the lowest rate, with only 0.06%. The recent pattern of great reduction of cases, seen on graph 1, can be explained, in part, because in the last years, SINITOX databank has received less information from specialized information centers. Thus, it is hard to define if the reduction seen during recent years is due to the lack of registration of cases, or if it is about a real reduction of cases. Besides that, the first 4 years of the period, shows a reduction tendency. Plant intoxication cases per total of registered intoxication cases (Table 1) indicates that relative frequency of cases involving plants has almost an equitable relevance during the analyzed period. Suggesting that general frequency of plant intoxication cases remain representing the same amount, about 1.29% of all intoxication cases. In general, numbers of intoxication can be greater than officially registered cases. Health professionals solve intoxications cases as pathological acute cases, and often they are reported as unknown origin (CAVALCANTE, 2015 apud PEACOK et al., 2009). Cavalcante (2015) study indicates that allied with registration errors, most of the health professionals formed in Brazil are not ready to deal with plant intoxication cases or recognize plants with toxic potential. What maybe can be responsible for recent higher inadequate registration of intoxication cases. Peacok et al. (2009) and Cavalcante (2015) apud Oliveira (2002) pointed out that deficiency of health system allied with low botany knowledge contributes to underestimation and diagnosis of plant intoxication cases. 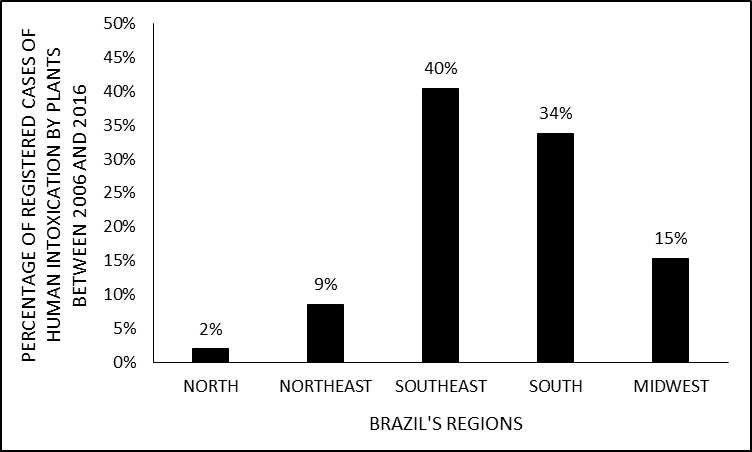 Differences between Brazilian‘s regions (Graph 2) shows that the southeast and south region presents the greatest registration of cases. 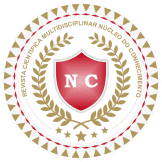 While north and northeast (northern regions) poses lesser registration of cases. 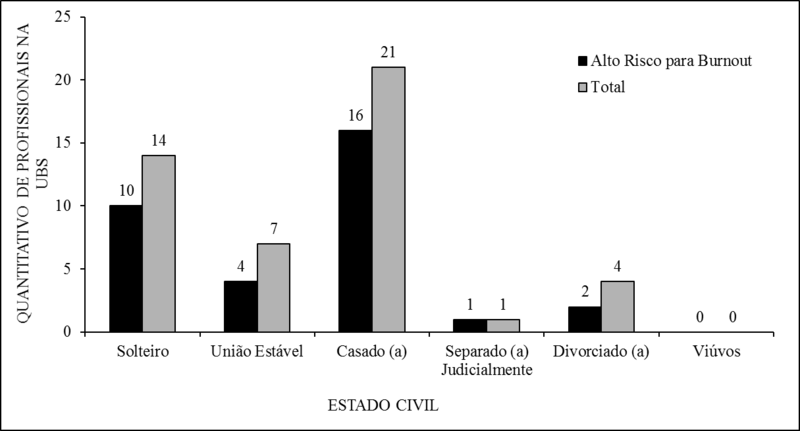 Vasconcelos, Vieira and Vieira (2009), promoted studies in Belém (capital of Pará state, belonging to north region of Brazil) showed that only 30% of interviewed people that had contact with intoxication cases resorted to medical treatment, 70% treated intoxication symptoms at home. Thereby, northern regions probably do not present a real low occurrence of intoxication by plants, but exhibit a low registration of cases as citizens do not usually resort to medical treatment. Food intake is the main circumstance associated with intoxication by plants (Graph 3). What can be correlated with the fact that 59% of cases are concentrated in 1-9 age group. In general, children are very attracted to the vibrating colors of ornamental toxic plants (PINILLOS et al. 2003), and also the natural curiosity of this life stage associated with cooking plays, or in some specific cases, starvation, makes children the most susceptible group to intoxication by plants (COSTA; BONFIM. FONSECA FILHO, 2017). Dieffenbachia sp., Caladium bicolor and Anthurium andraeanun are the most usual species associated with children plant intoxication (CAVALCANTE, 2015; VASCONCELOS; VIEIRA; VIEIRA, 2009; CAMPIOTO; POLETTO, 2012), all those mentioned species are widely used as ornamental, and can easily be accessed by children, since they are widely spread on landscaping, usually present on public squares, parks, and home gardens. In general, cases involving children under 9 years happens with plants cultivated inside children’s house (NEVES et al., 2014). The same author found that 50% of Minas Gerais citizens (southwest state) recognized Dieffenbachia sp.as a toxic plant, but 25% of them were not able to tell one single species of toxic plant. Garcia and Baltar (2017) study shows that during children holidays, number of cases of intoxication by plants is greater than the rest of the year probably associated with urban children having greater contact with places were toxic plants are accessible. Among adults, the frequency of intoxication by plants is considered high. Although the observed tendency of the analyzed period is to reduce along aging (Graph 4). Besides that, head adults circumstances of intoxication are inadequate use, suicide, and abortion. Researchs found similar results, indicating that abortion, medicinal and hallucinogen uses, are the major causes of intoxication by plants. Inadequate use, in general, can be associated with the search for hallucinogenic effects (LIMA; DO BÚ; ARAÚJO, 2014). Vasconcelos; Vieira; Vieira (2009) found the same when analyzing adults circumstances of plant intoxication. Campioto and Poletto (2012) also have already suggested that relation and discovered that Buxus sempervirens and Datura suaveolens are main toxic plants for adult’s intoxication. Abortion represents a significant circumstance associated with intoxication by plants. 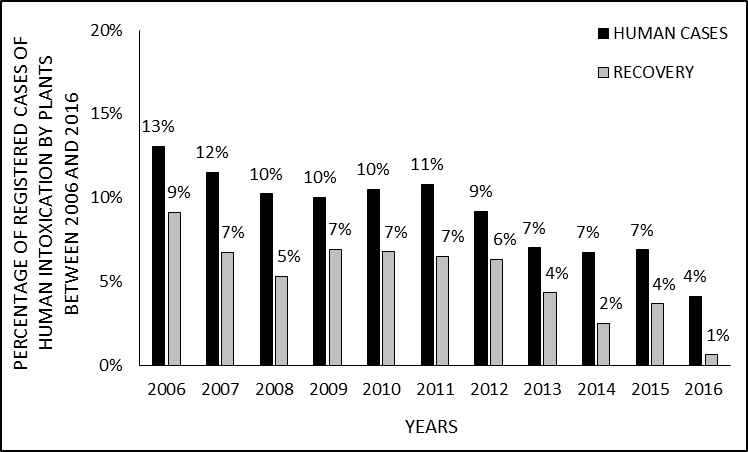 In addition, it is important to notice, that the percentage of registered cases of intoxication, suffer a slight increase during 20 – 29 years old group (Graph 4). Diniz and Medeiros (2010) found that Brazilian’s urban abortion rate reaches its maximum during 18- 29 years of age. Since registration of plant intoxications predominates on urban areas, the data suggests the increase of intoxication by plants rate during 20-29 age group is associated with a higher frequency of abortion attempts. Diniz and Medeiros (2010) also found that half of the women, who did an abortion at least once, declared that they had resorted to unconventional methods, excluding appropriate medicine. Self-medication represents 10.1% of all cases of intoxication during the observed period (Graph 4). Vasconcelos; Vieira; Vieira (2009) found that 82.4% of Belém citizens have plants at home to use as medicine and/or are able to recognize plants culturally used as medicine. Those scientists also found that this kind of circumstance was very common in Belem community, but, as mentioned before, 70% of related cases were treated at home. This indicates that probably, self-medication is underestimated. Recovery rate is high (Graph 5), besides that, a large number of cases involving plant intoxication had their outcome not registered. Data indicates that even there is no specific medicine to plant intoxication cases, the immediate medical care and medical procedures generate a recovery rate over 50% intoxication cases. Available data possibly underestimates the incidence of plant intoxication cases. In general, north and northeast regions besides the low registration, presents higher deaths, maybe, due difficulty of access and search for medical care. Children are the most affected group. The high occurrence of intoxication involving ornamental plants with vibrating colors corroborates that curiosity and cooking play could be associated with a higher incidence of intoxication in this group. Slight higher rate of 20-29 age group possibly is associated with higher abortion attempts. Association with other studies, promote clues that probably the self-medication rate is underestimated. Besides the lack of specific medications to treat plant intoxications, medical treatment reaches more than a half of recovery outcome. AZEVEDO, Maria Leila Gomes; MORAIS, Isabel Cristina Oliveira de. Perfil epidemiológico das intoxicações por medicamentos em Quixadá. Mostra Científica da Farmácia, [S.l. ], v. 4, n. 2, jul. 2018. ISSN 2358-9124. Disponível em: <http://publicacoesacademicas.fcrs.edu.br/index.php/mostracientificafarmacia/article/view/2326/1898>. Acesso em: 14 Jul. 2018. CAVALCANTE, R.M.H. A importância do conhecimento de plantas ornamentais tóxicas para a formação profissional dos alunos de medicina, enfermagem e farmácia de uma universidade da Paraíba. 2015. Monografia (Graduação em farmácia) – Departamento de ciências farmacêuticas, Universidade federal da Paraíba, João Pessoa, Paraíba, 2015. CAMPIOTO, S.M. ; POLETTO, R.S. Plantas tóxicas ornamentais: riscos que podem ser evitados pela socialização do conhecimento. In: CAMPIOTO, S.M. O professor PDE e os desafios da escola pública paraense: Produção didático-pedagógica. Cornélio Procópio:SEC/PR, 2012, 48p. NEVES, G.; LEMES, M.; FAY, S.; NUNES, P.A. S. S.; AEZ, R. B. S.; NUNES, J. R. S. Percepção dos moradores a respeito das espécies tóxicas existentes na praça da bíblia em Tangará da Serra – MT. Engenharia Ambiental – Espírito Santo do Pinhal, v. 11, n. 1, p.65-71, jan./jun. 2014. Biology Student. Phitochemistry Laboratory, São Paulo University (USP), SP, Brazil. Biomedical. PhD in Tropical Diseases. Professor and Researcher at the Federal University of Amapá, AP, Brazil. Collaborating researcher at the Tropical Medicine Nucleus of UFPA (NMT-UFPA). PhD in Clinical Psychoanalysis, Researcher by the Center for Research and Advanced Studies, Brazil. Biologist. PhD of Medicine / Tropical Diseases. Professor and Researcher at the Federal University of Pará, Brazil – UFPA. Biologist. PhD in Theory and Research of Behavior. Professor and Researcher of the Federal Institute of Amapá, Brazil – IFAP. Collaborating researcher at the Nucleus of Fisheries and Aquaculture Studies at the Federal University of Amapá, (NEPA-UNIFAP).